Editor’s Note: The author is the daughter of Dorothy Vaughn Shapleigh and the great-granddaughter of Sara Bull, a well-known American disciple of Swami Vivekananda and early supporter of his mission. 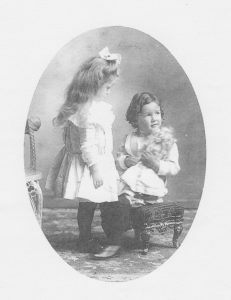 Baby Dorothy was adopted by Sara Bull’s daughter Olea Bull Vaughn (also called Sarah Olea by the family). We know that Olea knew and traveled abroad with Betty Leggett and Josephine MacLeod in 1906. Both were also friends and supporters of Vivekananda, although no mention of the either they or the swami is made here. Young Dorothy would have been four when Swami Vivekananda passed away on July 4, 1902. In this article we are given a glimpse into extended family life of one of Swamiji’s followers through a charmingly detailed account of her mother’s childhood. The author graciously provided copies of photographs and notes from her mother’s albums. These are shown in the two online albums appearing at the end of this article. A young Scottish woman gave birth to a baby girl. Sarah Urquhart named her baby Dorothy (“Doro Theos,” meaning “gift of God,” for that she truly was; her birth being quite unplanned.) Sarah was of the working class, an immigrant attempting to make her own way. For help she turned to the New England Home for little Wanderers on Boylston Street where baby Dorothy was placed. Sarah agreed to sign an adoption release when an appropriate family could be found. She then returned to work, leaving her baby in the care of the home. Before a year passed this was accomplished. Another young woman was grieving the loss of her own baby girl as well as the deterioration of her marriage. 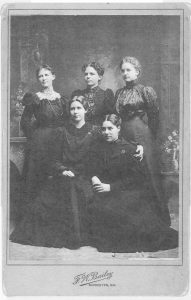 Sara Olea Bull Vaughn, with her former governess, friend and mentor, Abbie Bartlett Shapleigh, and Abbie’s daughter Amelia, contacted the Home in search of a baby girl. There they met tiny Dorothy, a pretty baby with a sunny smile. On March 6, 1899, before Dorothy’s first birthday, papers were signed and Sara Olea took Dorothy in her arms and into her home with the Shapleigh family. Theirs was a comfortable Victorian house set on a hill in West Lebanon, Maine, Olea’s birthplace and that of the infant she had lost. Here Olea felt cared for and secure, and would regain her health as she cared for her adopted daughter. Baby Dorothy was the center of attention, surrounded by the various members of the extended family. 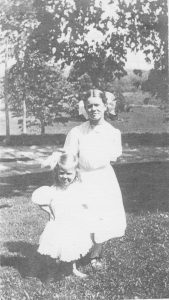 At that time the Shapleigh family consisted of Abbie Bartlett Shapleigh, her daughter Amelia – only two years older than Olea: Abbie’s niece Alice Bartlett, a housekeeper, a cook, and a herdsman who cared for the animals in the barn. Abbie’s son, William, visited frequently with his young wife and three little boys. Country life was quiet and predictable. As little Dorothy’s toddling turned into tentative walking and then running, she eagerly began to explore her world. Her Mamma walked with her up the lane behind the house where they picked wild flowers and dabbled their fingers in the cold water of a spring that ran into a pipe and down to the kitchen. Mother and daughter developed a bond which was to remain in Dorothy’s heart for the rest of her life. When Dorothy was two years old a baby boy joined the family. David Miller Vaughn became Dorothy’s little brother. The two remained close throughout their lives. Now these austere Victorian women had their hands full. As both Abbie and Amelia were active in the small community it often fell to Cousin Alice Bartlett to help Sara Olea with her children, feeding, bathing, dressing, and also entertaining. Like both her parents, Olea was a skilled musician, playing the violin as well as the piano in the front parlor where Sara Bull once accompanied her husband playing his violin. Both Dorothy and David developed a fondness for music although neither ever learned to play an instrument. Little Dorothy’s toys were varied and whimsical: a wooly gray elephant with big eyes and a red saddle-pad, just the right size for a tiny tot to straddle and propel across the floor; a miniature suede coved cow that said “Moooo” when its head was turned: numerous tiny dolls from other countries with doll-sized furniture; a tan stiff teddy bear, stuffed in a manner indicative of German lineage; and a pretty felt doll with blonde hair and a pink organdy dress. Out in the barn stood a handsome rocking horse, black and white with real horsehair mane and tail, a bridle and a real saddle. During the summer months picnics at a nearby lake were a treat often enjoyed, especially when guests brought small children. Well-packed hampers were carried outside and placed in the wagons after the Norwegian ponies were harnessed. Then everyone climbed in and the ponies set out briskly to cover the four miles to a pine grove beside the lake. There the three ponies were unhitched and tied in the shade to rest and quench their thirst before the drive home. The children frolicked and tumbled about in the shallow water at the lakes edge, always under the watchful eyes of adults clad in the bathing fashions of that day. After a sumptuous lunch, many napped on carriage rugs under the pines; then more water play before drying off and heading home. The swaying carriages and rhythmic clop-clopping of pony feet often lulled little ones to doze off. After a small evening meal in the kitchen, the children usually fell willingly into bed for a much-needed night’s sleep. On other days there were picnics much closer to home. Baskets containing lunch or afternoon tea were carried up into the apple orchard where blankets were spread beneath the boughs and refreshment enjoyed. Dorothy and David brought dolls and teddies to these occasions. One greatly anticipated summer event was a trip to York Beach, 28 miles away. Everyone except housekeeper and cook packed their carpet bags with bathing wear and assorted necessities. The three ponies, groomed and harnessed, were hooked to two wagons early on a mid-summer morning and everyone climbed aboard. On their way through the village they returned the waves of friendly on-lookers. About fifteen miles down the road they paused in South Berwick at the home of Sarah Orne Jewett, a family friend. There they watered the ponies and refreshed themselves with a quick lunch before settling out on the remaining leg of their journey. About half way down the York Woods Road they paused at Maud Muller’s spring where ponies again drank the fresh cold water. By late afternoon three tired ponies pulled the wagons into the driveway of the Anchorage Hotel, at Long Sands, York Beach, Maine. At the front entrance, beneath a porte-cochère, they halted, allowing everyone to climb down. Retaining a valet to care for their bags they entered the dark fan-cooled lobby, leaving the ponies to be led out to stables in the rear where they were to be unhitched, unharnessed, rubbed down, and the hired man would see that they were safely stabled and fed. For several days the family enjoyed walks on the long sandy beach, wading in the cold Atlantic, and taking leisurely meals in the hotel dining room. Once the children were in bed for the night Cousin Alice was the one to remain upstairs to watch over them, entertaining herself by reading, knitting, or crocheting. Sometimes she wrote poetry, which she liked to recite to anyone who would listen. There is an enlarged photograph of Abbie with little Dorothy, age two and a half, walking barefoot at the edge of the sea, both wearing long-sleeved outfits and large protective sun bonnets. A watercolor painting re-captures this scene. Both pictures are framed and hang together in the parlor today. As autumn came on and air turned chill, the entire household moved down to the village to a smaller house for the winter months. Rooms were smaller, ceilings lower, and commodities closer by. Fireplaces and wood burning stoves heated the cozy home. As Dorothy and David grew older they were expected to help the hired man carry in wood for these fires. This was no small chore, as every room was warmed by a fireplace or some style of stove. In the kitchen a cooking range with water reservoir at one end provided not only heat but the means of baking, cooking, and hot water. In the evening, after soap stones were heated and wrapped to take to bed, coals in the range and fireplaces were banked with ashes for the night. Come morning one had only to stir into the bed of coals with a long-handled poker, add bits of kindling, give a few puffs with bellows and once again fires blazed to warm the waking family. Breakfast was often thick slices of oatmeal bread toasted over the open fire on long-handled forks. Liberally spread with sweet butter from a nearby farm and eaten with applesauce or other preserved fruit form a well-stocked pantry; this first meal of the day was always enjoyed. Children sat on stools at the small table by the fire. 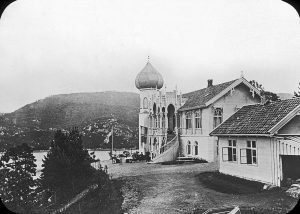 The Bull Villa in Lysøen, Norway, built in 1873. Nearly every summer, until Dorothy was ten years old, the family went to Norway, to the island of Lysøen, Olea’s parents’ home, and that of her own childhood summers. After opening the “Big House” on the hill in West Lebanon, steamer trunks were brought down from the attic, carefully parked and loaded onto a farm wagon. Ponies were harnessed and carriages took everyone to meet the train to Boston where they boarded on a trans-Atlantic steamer that took them to Norway. After twelve days of travel they were welcomed to the picturesque island villa by Jorgen and Fruken Jensen, caretaker and housekeeper, faithful retainers who cared for the property throughout the year and lived in a cottage near the landing dock. Sometimes Jorgen took Dorothy to pick wild strawberries on the low-pitched grass-covered roof of his home. As northern lights began to play in the night sky warning of cold months to come, once again the steamer trunks were packed and the family bid a fond ‘farvel’ to their island world. In Bergen they boarded another steamship, headed out into the North Sea and across the Atlantic Ocean to America. For Olea, leaving her island must have been particularly difficult. There she must have felt less constrained, experiencing a greater sense of freedom, and, being by birth half Norwegian, more “at home.” Some summers her mother, Sara Thorpe Bull, came to Lysøen for several days. Dorothy remembered that she read poetry to the children and took them for walks in the forest. Treasured were Dorothy’s memories of this quiet and aloof lady. Back in West Lebanon summer days were still warm and again the Big House was full of life. Sara Olea was very involved with her two young ones, seeing to their socialization as well as their more formal education. There were overnight trips to Eliot to visit Bartlett cousins and brush up on the children’s manners as they joined with adults for lunches and afternoon tea. In West Lebanon there were covered dish suppers and afternoon socials held in the Lebanon Academy. Here Dorothy and David mingled with village children playing tag, giant steps and hide and seek. During cold months when the family lived in the village Dorothy and David had their lessons with a tutor, going to his home every morning where he had a “school room” set up. They returned home, a short walk up the road, for lunch, then a nap and an afternoon of homework. After supper one or another of the adults read to the children until bedtime. Estranged from her husband, and with her children preoccupied with their studies, Sara Olea grew restless. Felling a need for more excitement she often escaped to the city – Boston or New York – where she circulated among friends of her own age and similar interests, those of theatre and music. She secured small parts in several plays. Among this group of active young adults was an up and coming attorney, having earned his degree from Boston University in 1892, he joined the firm of Charles and Thomas H Russell in Boston. He was one of the Bartlett cousins of the Shapleighs and so knew something of Olea’s family situation. He befriended her, offering to assist in obtaining a divorce from Henry Vaughn, the errant husband. When Dorothy was nine years old her Mamma did not include her or the rest of the Shapleigh family on her summer sojourn to Lysøen. Olea did, however, invite the young attorney, Ralph Bartlett. Perhaps he felt the importance of appraising her inheritance in Norway. Sara Bulls health was deteriorating and her daughter was her only heir. When summer ended Olea and Ralph did not return to America, but traveled to England, France, Spain, Switzerland and Italy. 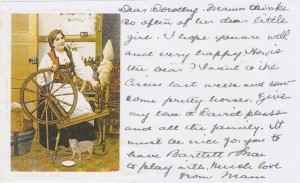 Dorothy received cards almost daily from “Mamma, with love.” A beautifully assembled album remains as testament to that endeavor. Meanwhile, Dorothy and David were occupied with their studies and ongoing activities of the busy Shapleigh household. Sylvea and Dorothy on the day of their Mama’s funeral. When Sara Olea finally returned to West Lebanon, in January of 1909, the family was in their winter home. Late one afternoon a horse-drawn carriage pulled into the dooryard. Everyone in the household rushed to the door in anticipation. Olea stepped down carefully, cradling a blanket-wrapped bundle in her arms. Abbie stepped out to take her arm while calling to the hired man to come and help. The driver was eager to be off on this cold, nearly dark afternoon so he quickly unloaded bags while his horses stamped and blew puffs of steam. Abbie took the blanket bundle and passed it to Alice while Amelia helped Olea with her cloak. Alice passed the bundle to Dorothy who found herself holding a tiny baby with very cold fingers and toes. Quickly she took the infant close by the open fire where she unwrapped the baby, warming the tiny hands and feet. Alice made a pot of hot tea and took it to the upstairs chamber where Abbie and Amelia had taken Sara Olea, exhausted from her journey. The baby was a girl; her name was Sylvia. And so Dorothy was immediately installed in her new roles of big sister, babysitter, protector, defender, caretaker and number two daughter. Dorothy’s idyllic childhood had come to an abrupt end. She was ten years and ten months of age. Sylvia was now the center of attention. Sara Olea had returned to her Lebanon family in greatly weakened condition. Despite the loving care and nurturing of those around her, she never fully regained health and strength. Her health was further compromised by the emotional turmoil of the trouble fraught relationship with her own mother whose health was also failing. Sara Thorpe Bull now resided in her Cambridge, Mass. home attended by her faithful friend and companion, Nivedita. In January, 1911, Mrs. Bull died. Mother and daughter were never reconciled. In June of the same year Sara Olea, Dorothy’s beloved Mamma, also died. Her three children were left to be raised by Abbie and Amelia Shapleigh and Cousin Alice Bartlett. Amelia’s brother Will also played an integral role in the children’s lives. Sara Olea Bull Vaughn, “Mamma” to Dorothy, David and 2 ½ year old Sylvia, was buried in the Shapleigh family cemetery beside the Big House. Dorothy, 13 years old, picked wildflowers in the field behind the Big House, and placed them on her Mamma’s grave. Click any image in the albums below to open it in full view. Click the ”i” to toggle information about slides on/off. You can “page” through an album using the onscreen or keyboard arrows. Click the Play icon to automatically view the images in a Slideshow. The author sent us printed copies of photos of her mother's childhood and of those who formed Dorothy Vaughn's new and loving family. Whenever Sarah Olea Vaughn was away from home she would send handwritten notes to her daughter. Some were messages on picture and postcards. Others were delightfully illustrated notes. A few samples have been made available for display.